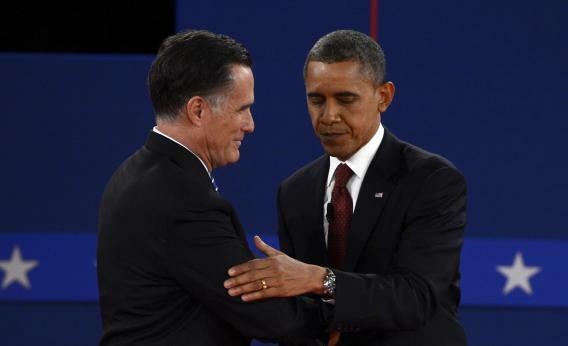 Obama-Romney debate: The three ways Romney lost last night. Photo by TIMOTHY A. CLARY/AFP/Getty Images. Moderator Candy Crowley’s best efforts to maintain order couldn’t survive the testosterone battle last night. It was not only great TV, but a superb debate. The key takeaways: Barack Obama is back and moderate Mitt Romney can’t withstand careful scrutiny. While Romney’s economic agenda has a superficial appeal to a lot of folks who are still suffering from the aftermath of the 2008 cataclysm and the evisceration of middle-class wealth that has been ongoing for over two decades, his plan is old wine in new bottles, flawed conceptually and arithmetically. Romney plays on the discontent of a public desperate for better economic times, but he offers up merely tax cuts and a passive government when much more is needed. The auto bailout disagreement perfectly encapsulates the intellectual conflict between the two candidates. The results of the experiment could not be more telling: The bailout really did save an entire sector, and a million jobs, while Romney’s claim that there was an alternative is simply false. There was no private financing available. None. The capital markets were frozen and had the government not stepped in, the entire sector would have shut down. Romney’s one-dimensional view of when government must intervene is belied by the reality of what happened. Let Ohio take note. Second, Romney’s tax plan really doesn’t add up. A $5 trillion hole can’t be filled by the less than a trillion raised by capping deductions, and his overarching claims are simply inconsistent. He says the plan is revenue neutral; the rich will still pay the same percentage of the tax bill that they have been paying, and the middle class is getting a tax cut. Those pieces don’t add up. It is simple arithmetic. Third, Romney tried to capitalize on the festering anxiety about the tragedy at Benghazi, but has no answers or ideas when it comes to Libya, Syria, or Iran. Bellicose language does not a foreign policy make. Finally, with respect to guns, both candidates failed us. A simple “I have caved to the NRA and am doing what I know to be wrong,” would have been much better than their bobs and weaves. I am still confident that the resurgent president will win this re-election campaign. But I hope that between Nov. 6 and Jan. 20 somebody on his staff comes up with a second-term agenda. We haven’t heard it yet, but whatever they cobble together with will surely be far better than anything the Romney camp has conjured.